Auto transport is not a complicated process. However, we understand that shippers can be stressed and overwhelmed by it because transporting a vehicle is not something people do every day. In fact, most of our customers are first time shippers and it is completely understandable that they feel tense at booking. That’s why we have developed this website where customers can find a ton of a useful information. We have a frequently asked questions (FAQ) section where customers can find answers to the most common auto transport questions and a Blog where we constantly publish tips and interesting articles. We would like to share some very important information here. We would like to talk about proper pick-up/delivery inspection and what a valid Bill of Lading must look like when customers sign it. The pick-up and delivery inspections are two of the most important operations a customer should do together with the auto transport carrier driver. When the inspection is done it is important to mark everything on the Bill of Lading, which is the official document and a binding contract. What is pick-up and delivery inspection? How to do a proper inspection? Auto transport is a process that could take anywhere from two to ten days, or even more if shipping from Hawaii or to Alaska. As a customer you should keep in mind that you are part of the process. Once you have booked with us over the phone your job is not over. When you call us to arrange the transport we explain the whole process and include information in the emails we send, however, customers tend to not read them all. This is normal because we know everybody is busy with work and family. We urge our customers to read every email we send and try to be present at the pick-up and delivery of their vehicle. After booking of the order we send a confirmation email containing the order summary and detailing the next steps, along with important facts to keep in mind. First, we advise customers to keep their phones with them when the time for pick-up/delivery comes close. It is important that the car carrier can get in touch and arrange the pick-up/delivery date and time. Carriers usually call 12-24 in advance and then another 2-3 hours before they arrive. In these emails we also explain how payment works and that carrier insurance does not cover items loaded in the vehicle or damages caused by any items inside the vehicle. When we dispatch a truck to pick-up a vehicle, we send a dispatch confirmation email with more important information for customers to read. However, what is and how to do a proper inspection at pick-up and delivery? What happens is that many customers leave it to the trucker or do not do an inspection at all, and this is wrong. Any type of moving services usually require customers to be involved in the process. Just like when you are moving to a new house and have to overlook everything, when you are shipping a car you have to do a few basic things besides paying and waiting. It is crucial that you do a proper inspection together with the trucker. In fact it is a simple process that takes about 10 minutes. It is recommended that pick-up and delivery happen during the day, at daylight, in order for you and the driver to conduct a proper inspection of the vehicle. It is also recommended that you have prepared your vehicle for transport, which includes washing and checking for mechanical problems such as any leaks. The trucker must have a legit Bill of Lading where he or she will mark any preexisting scratches and dents. It is recommended that you take pictures at pick-up and delivery. You have to walk around the vehicle with the truck driver and carefully check for any preexisting damages that have to be marked on the document. This is a crucial part of the shipping process that will guarantee legitimate actions on the side of the carrier’s insurance, in case of damages during transit. It is highly recommended that you ask the driver to mark down your current mileage’s odometer, as well as that you take pictures of it at pick-up. If pick-up or delivery takes place in the evening you have to make sure sufficient light is available to do a proper inspection of the vehicle. In the evening it could be harder to see any scratches that may have happened during transit. We recommend that you meet with the car carrier at a well lit location such as a parking lot where the inspection can be done and documents signed. Damages are not an expected part of the process, but they can happen. That is why it is important to have done a proper inspection and marked everything on the Bill of Lading. When you have a legit Bill of Lading, signed by both parties, then you have a legal document to file a claim, if necessary. What is a proper Bill of Lading that you must sign at pick-up and delivery? What does a Bill of Lading look like? Below we have uploaded a copy of the real document so you can see what a legitimate Bill of Lading must look like. 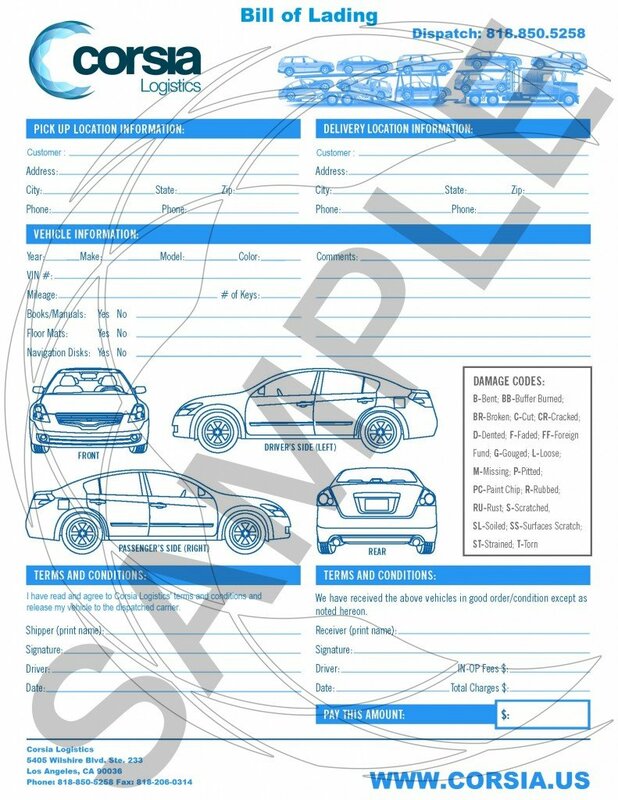 This is the type of document you should receive from the car carrier at pick-up and delivery. A Bill of Lading should always has this middle vehicle section where you and the trucker can mark any damages and dents. If there are any new scratches to your vehicle you must mark them on the document in the proper area of the image and write down in the comments an exact description of the new damage. Also, it is highly recommended to take pictures at delivery, just the way you did at pick-up, especially if there is new damage. Additionally, please keep in mind that after the inspection, if there is a balance due, legally you still must pay the trucker even if there is an issue with the vehicle. An insurance claim and payment of freight charges are two entirely different transactions. Later, with the Bill of Lading and the pictures you can submit a claim to the insurance and the process will be taken care of in a professional manner. It is your right to inspect your vehicle at the time of delivery and it is your right to mark on the Bill of Lading any issues you find with your vehicle. After inspection you are still legally bound to pay the trucker the transport fare, even if there is an issue with the vehicle. It is very important that you do a proper inspection of your vehicle, especially at delivery. If a new damage has occurred during transit you will need a Bill of Lading signed by both you and the trucker in order to submit an insurance claim. If you need any assistance at pick-up or delivery please call us at 818-850-5258 and we will help. Our agents work with you from start to end, every step of the auto transport process. Thank you!